Partnering with an agency to produce video marketing for your business is an important choice for any serious business leader. You’re not simply creating a video. EVERYONE that encounters your business will watch your video. You’re choosing an agency to convey your message, your vision, your business… to the world. Business owners that don’t have a background in marketing understandably find it difficult to work out the difference between PROFESSIONAL agencies … and amateurs. The problem is, if you don’t partner with professionals, you simply don’t get the business results you need. 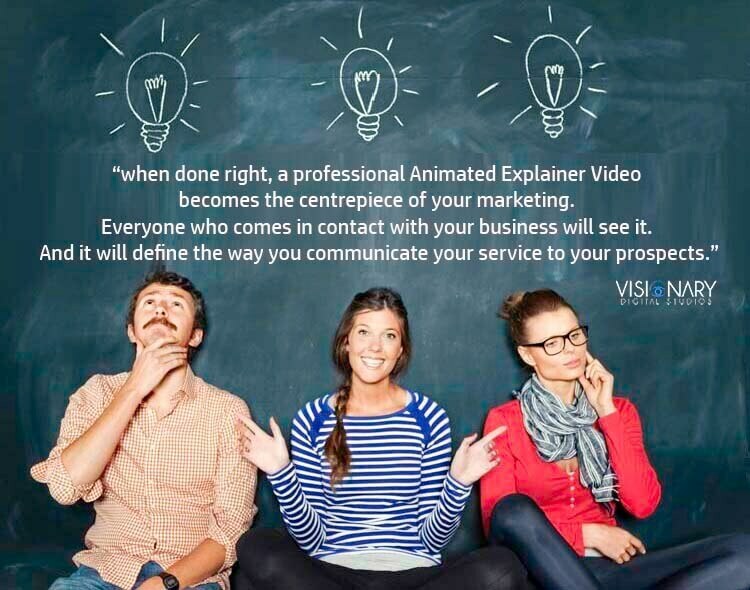 However, when done right, a professional Animated Explainer Video becomes the centrepiece of your marketing. Everyone who comes in contact with your business will see it. And it will define the way you communicate your service to your prospects. 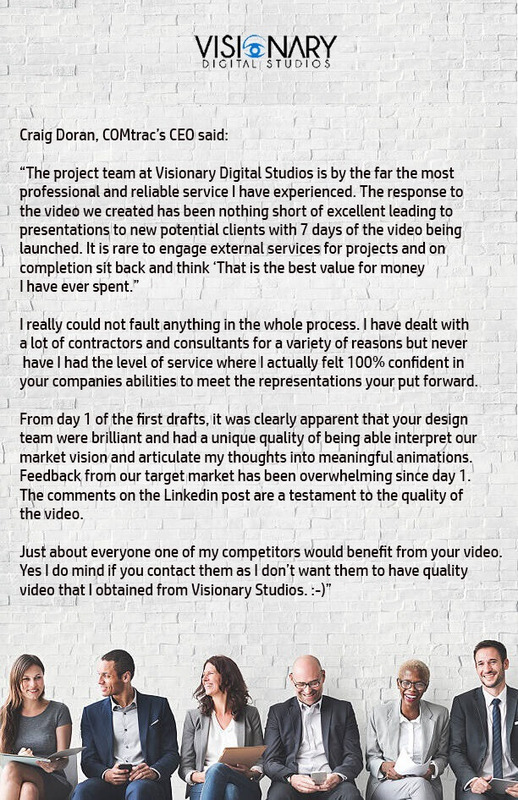 Here are some of our favourite reasons for you to choose Visionary for your Animated Explainer Video project. Any marketing project should have a well defined strategy before it starts. Similarly, marketing projects should NOT be conducted by anyone without a demonstrated marketing skillset. Because if your business is being communicated in the incorrect way, EVERYONE that encounters you receives a sub-optimal message. 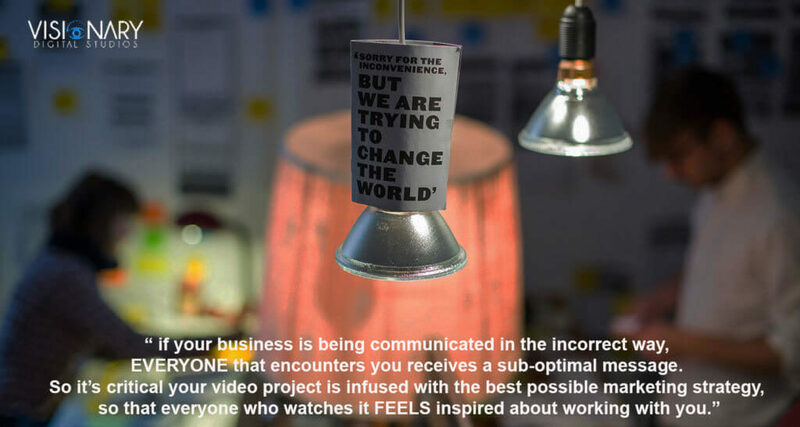 So it’s critical your video project is infused with the best possible marketing strategy, so that everyone who watches it FEELS inspired about working with you. The Strategy Session at the start of a project is an excellent way for you to feel assured you’re working with a team of professional marketers that will get it right. During the Visionary Strategy Session, we will educate you about your offering and your marketing. We will show you what angles will drive buying decisions in your prospects. And we will explain the video marketing strategies you can use to achieve dramatic results in your business. Strategically designed marketing videos will make viewers FEEL like the brand being explained is established, credible and trustworthy. Video viewers who don’t understand modern design theory, won’t even know why they feel this way. They will just naturally assume that the company being conveyed can be trusted. This is the power of strategic design. This design skill set is a complete science in itself. Sure, our designs will WOW your audience, and impress your colleagues. But more importantly, our design will always be STRATEGICALLY FOCUSSED on achieving your business outcomes. We’ll invite your creative feedback throughout the project – however, we’ll take the lead on strategic design direction, and explain why our designs will achieve results. This means no silly-looking characters or “wacky” voiceovers in your video. We’ll include the right level of animation detail and effects so that anyone watching your video FEELS that you are a credible, established company that they can trust. When you look at the example videos we send you, do you FEEL like the brands being explained are credible? Trustworthy? Industry leading? This effect has all been strategically planned by our design team, so that our videos achieve tangible results for our clients. Our aim throughout the project WON’T be to do the least work possible for the most possible amount of upsells (unfortunately a common practice in our industry). We’ll always be focussed on giving the most amount of value possible at every step of the project. But just don’t take our word for it. Have a look through our testimonials. The same themes appears over and again when we ask our clients what they thought about their project. – We make the process super-easy for you. – We achieve tangible business results. 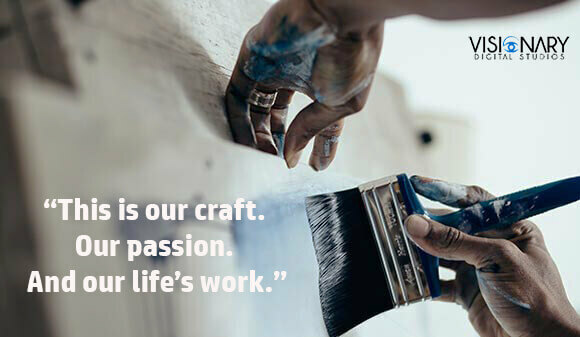 – We’re passionate about our craft. – We deliver an amazing customer experience. HOW DO YOU FEEL ABOUT THE VISIONARY BRAND? At Visionary, we’re in the business of emotionally inspiring target audiences to make buying decisions. So it goes without saying … you should FEEL an emotional connection with OUR brand. You should feel DESIRE to work with us. You should innately know that we are professionals at our craft. So … how do you FEEL about our marketing, our processes, our people and our portfolio so far? You’ll see our Animated Explainer Videos throughout our marketing and sales process. And we use the exact video marketing strategies we sell in our “ATTRACT LEADS & SCALE” package, every single day! … well, because they work! It is simply amazing to us when we come across companies that don’t use their own products. Any Animation agency with professional marketing experience and confidence in their product will be using their own videos throughout their marketing strategies. At the end of your project, we’ll conduct a “Visionary Launch Session” with you, and provide a full Video Launch Handover Pack. So you’ll be able to implement your video in all of the same ways as we have, and use all the same strategies we do throughout your marketing efforts. At Visionary, we consider ourselves thought leaders in our industry. And we release regular content to prove it. Throughout our marketing and sales process, we’ll provide you blog articles, videos and white papers to help educate you. This will continue during the production process. 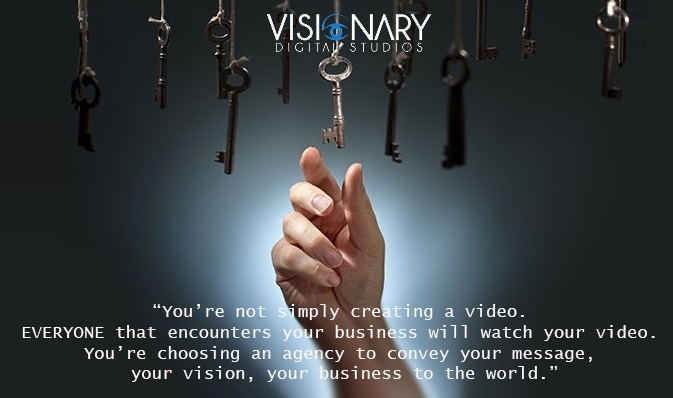 A Visionary project is firstly about achieving your business outcomes using video strategies. But we also want to ensure that after your project, you are armed with marketing expertise to take your business to the next level, using your video. Our business isn’t just about getting us rich. This is our craft. Our passion. And our life’s work. There is no hiding in the digital age! It’s easy to assess the historical experience of Visionary, using LinkedIn. You can quickly get an idea of our agency’s skillset by reviewing the experience of not only the contacts you speak to, but even our staff. We’ve worked with New York Times Best Selling Authors. The Association for Data-driven Marketing & Advertising (ADMA Australia) trusts us. And we’ve worked with visionary clients from 6 countries. Our past experience will obviously provide an excellent indicator of our team’s level of knowledge and experience. 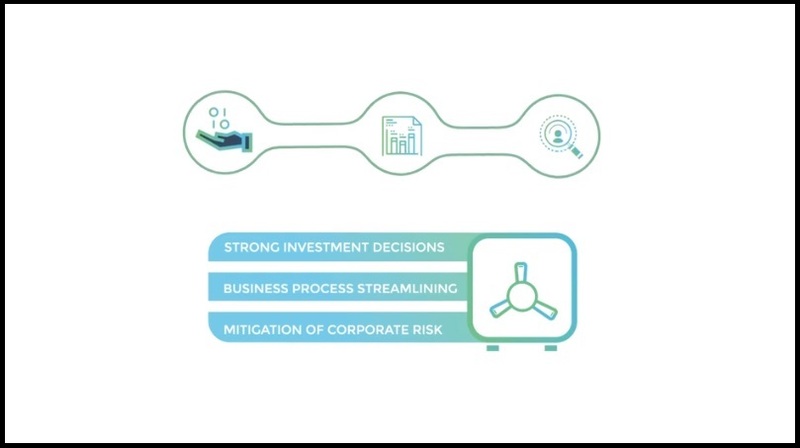 But it also gives you an insight into our industry connections, the resources we have access to and the impact our company is making in the industry. 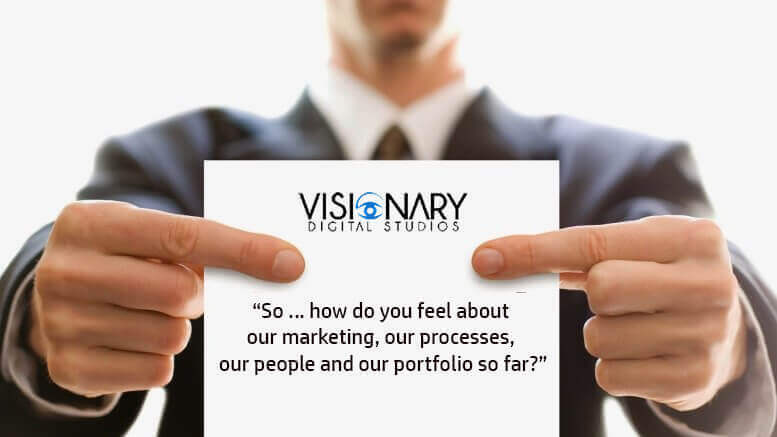 Here at Visionary Digital Studios, of course we believe that we are industry leaders in our craft! Regardless of who you choose to work with, the key takeaway from this article is that you choose a professional MARKETING focussed agency to deliver your message to the world. An agency that will achieve tangible business results. Not just a “video for the sake of it”.